What an absolutely glorious sight! And to succeed in capturing this beautiful butterfly with my Canon PowerShot A60 point-and-shoot camera is beyond my wildest expectation! 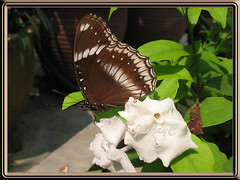 I was actually capturing images of our Brunfelsia calycina/pauciflora bush one lovely sunny morning in May when this Great Eggfly fluttered around and decided it wanted a photo session too! It chose to settle on a group of lovely blooms, clever choice for a complementary backdrop! And I couldn’t believe my eyes when this gorgeous looking butterfly with wingspan about 7-8.5cm, fanned out its wings and ‘cheekily beckoned’ me to start shooting! I was so excited and just click…click…and click as many as I could capture! It posed for so many shots, as if it knew that I greatly desire to capture such precious moments! Wow!…15 shots to be exact when I downloaded into my personal computer later on and all turned out very nicely! 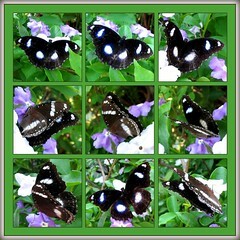 A collage of nine images of the Blue Moon Butterfly was created to reminisce those wonderful and joyous moments! Images were cropped and presented in such a manner so that I can feast repeatedly on the spectacular display of its many poses, specially posed for me on that unforgettable morning! What joy, what bliss! How blessed! 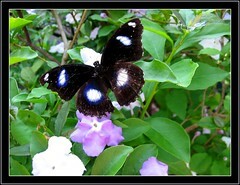 More info on this Blue Moon Butterfly at Wikipedia which included its distribution, habitat, life history, etc. I’m so happy to have captured this beauty ten days ago, displaying its beautifully patterned wings.